It's official. I am half done the lace edging for the Icelandic shawl. I'm looking for a big wide shawl from this. The size is one of the reasons I wear my black and red Einband shawl as much as I do and I want something of a similar size this time. Since the start I figured I would probably be making it wider than the pattern requires. Not so. This reaches from my fingertips to past my other shoulder. And that is without blocking the wondrous way Einband blocks. It will be generously wide. I really enjoy knitting on this. I haven't worked on this for any large amount of time since catching the error. I knit a motif here and there between things. It only takes a few minutes to zip out the twelve rows. And suddenly, half done. the goat from her book! It is really quite sweet and wonderfully detailed. And here is some spinning! I still know how to do it! Not that I expected to forget mind you. Sometimes I wonder if the knowing some of these things is not an inherited trait, so deep do these things run through me, and all I need is a reminder, an awakening, to know what and how to do things. Not that I do them perfectly. I think that will take a lifetime to accomplish but fibre work comes so freely to my hands. I had marvellous time. 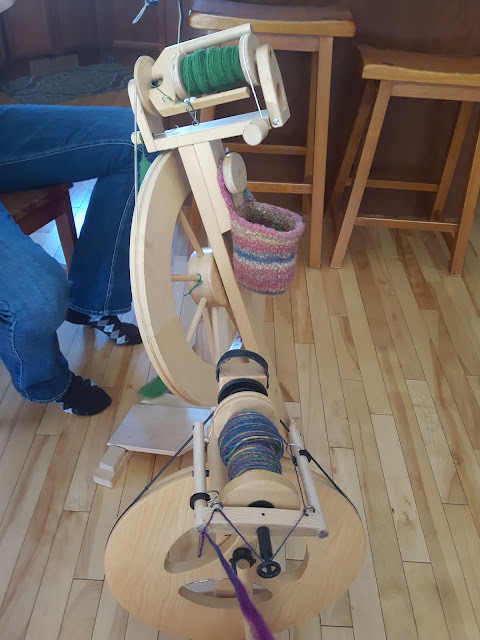 Much wool was spun! After spinning, I took myself off to the fabric store. I almost cannot bear to look in my clothes drawers, so devoid of colour and pattern they are. I tend to simple and for years I have tended to basic colours, worn topped with bright scarves and more recently, interesting sweaters, but summer is soon here and I just want more than plain t shirts. I was hoping for at least one wild print like the Hawaiian shirts Magnum PI made famous in my youth. I wanted wild flora and fauna, ferns and toucans and Bird of Paradise flowers. I couldn't find exactly what I was looking for. I wanted soft flowy drapey knits in rayon or cotton polyester with vibrant prints, but there were no fabrics such as I wanted to be had. The printed knits were all heavy, more suitable for skirts or just straight woven cottons. Or kiddie prints and not even too many of those. I found a few things that will add a bit of life though so not at all a waste of time. There is a really soft flowing wide striped rayon knit fabric and two lovely striped pieces, also rayon, that will make marvellous tops but the real find is this one. A Missoni like remnant from a bin of 'stuff'. It isn't very wide so there isn't enough for a top all on it's own, but in truth, I don't think it would show off just how lovely the colour and pattern is as a standalone. It would almost overwhelm itself. I'm going to insert a section of it in some of the black knit fabric to give it just the right amount of punch. There is something about black off setting a strong colour or design that makes my heart beat just a little faster! The other thing I wanted to show you actually happened while I was off on my knitting retreat though I only picked it up yesterday. I won this sweet bouquet in a silent auction. It's almost too cute to break apart. It's a tiny boozy delight! Not that I drink much. A little goes a long way but this was just too sweet to not try for. Congratulations on a great fundraiser to the Bruderheim Firefighter's Association entry into the Fire Fighter's Stair Climb Challenge. My daughter in law, Olga, is part of the stair climb team and I am so gosh darn proud of her. But to everyone with the Bruderheim Firefighter's Association, you are amazing people and your work is making hospice care better for everyone. There was lovely thread on Ravelry the other day. A lady asked what people thought about knitting a farm for a wide window ledge in her home. She had a pattern book by a Sachiyo Ishii , Mini Knitted Farmyard , she loved knitting little things, but wondered if she was possibly going just a bit off her rocker and that people would start to wonder about her. She really wanted to do it, but just wasn't sure what people would think and needed some confirmation from other Ravelers. She got it in spades. Thanks to this conversation, I have an entire new line of books to think about. and have firm plans in place to use them with my miniature adventures. But I also have Knit the Christmas Story and have spoken of my desire to have a copy of Jean Greenhowe's knitted dinosaur book and an abiding love for Frankie Brown's woodland and seasons wreaths. I love little things. So when I say I have fallen for Sachiyo Ishii's work, that would be understating the case. 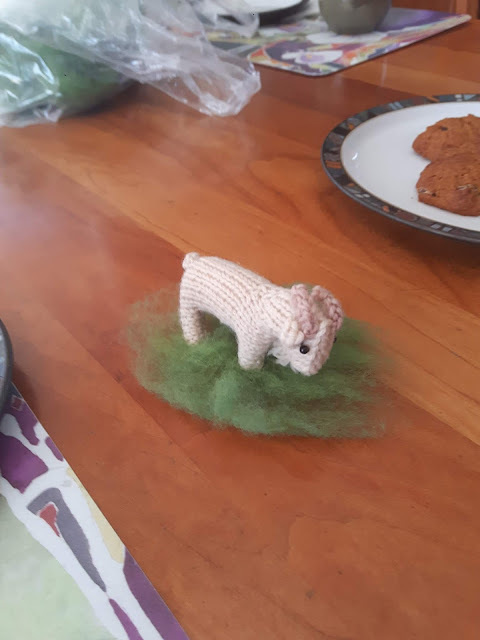 For not only does she have a book on a farmyard, she has book of a Mini Knitted Ocean, and Mini Knitted Woodland, she has a Mini Knitted Cosmos. Who wouldn't want to knit a Mini Knitted Cosmos? It was so lovely to think about knitting things as sweetly silly as these. 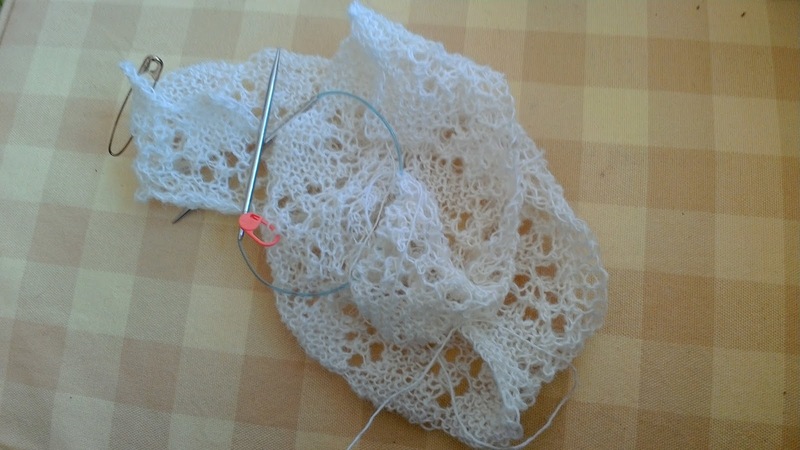 It is so easy to get bogged down in gift knitting and ought to knits and just the usual things you like to knit. It shouldn't but it happens so it is always delightful when something pops up that is just silly happy joyful knitting. Knitting should bring joy and should illuminate the dark part of your soul. It usually does, but a refresh of a different sort always makes me happy. Today I am off spinning. Haven't done that in a while so that too is a kind of refresh. And I'm stopping at the fabric store. The whole day is a kind of refresh.